It’s not very often that you see people doing yoga in the sea. So, always up for a challenge, I went to give stand up paddle board yoga a try. A stand up paddleboard (SUP) is a large surfboard that is wide and stable enough to stand on and use a single bladed paddle to propel yourself through the water. The idea is simple: you perform normal yoga, out on the sea, on a stand up paddleboard. Prior to trying this class, I’d been to one yoga class and had one (brief) go on a SUP. What could go wrong? 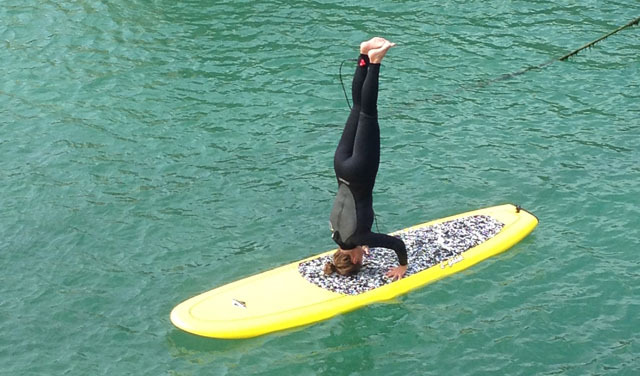 I went down to Newquay Harbour on a cloudy Sunday afternoon in September to meet Jen Austin, who runs Shine Yoga UK, and Lee Norris of SUP Cornwall who provided the SUPs. After pulling on a wetsuit and being allocated our boards, Lee gave us a quick introduction to stand up paddleboarding. We were then let loose in the harbour, paddling around on our knees and eventually climbing to our feet. I let out a few girly screeches as I tried to stabilise my board, but once you catch your balance it’s surprisingly easy to get the hang of. Shielded from the wind, gently gliding along on the serene water in the harbour was relaxing. Once we’d become accustomed to the board, it was time to unleash some yoga poses to the bemusement of the growing crowd of onlookers. Anchoring our boards with makeshift weights attached to the leash meant we didn’t drift too far away from the group, although this didn’t quite stop the occasional collision with your neighbouring yogi (a yogi is someone who does yoga, not a cartoon bear). Jen took us through a series of yoga positions, including the downward-facing dog (above) and the child’s pose. Yoga is great for improving strength and flexibility and having to balance on the board makes for an added challenge. The calming sound of the sea lapping against your board brings a unique element of tranquility that you don’t get in a yoga studio. But be prepared for the occasional giggle as someone inevitably topples in. Determined to pull it off on a SUP, I’d been practising my headstand up until this day. Trying to hold my balance is challenging at the best of times and unfortunately, trying to stabilise the board was too much and I couldn’t quite extend my legs (see below). I had managed to stay dry until this point, but falling in was all part of the fun. This is as close as I got to a SUP headstand. Luckily, Jen, who has practiced yoga all over the world, was on hand to show us all how it’s done. It’s best to leave it to the experts. Not recommended for those who are scared of seals, as they made an appearance towards the end of our lesson. 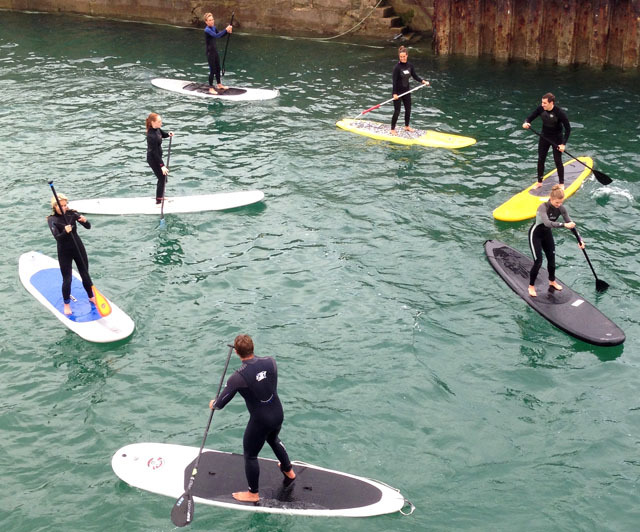 An hour’s lesson costs £15, which includes SUP hire. Wetsuits can be hired for an additional £2.50. For more information visit Shine Yoga UK or contact via email: [email protected].